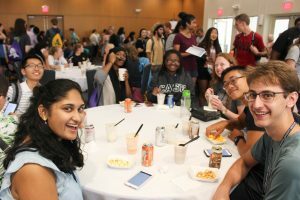 Home / News / Welcome, Class of 2021! Students of the class of 2021 have started college in full swing. Joining clubs, practicing sports, attending auditions and navigating classes has helped students acclimate to the campus and college life. The class of 2021 was part of the largest pool of applicants yet, with one-third of a record-breaking 25,379 applicants being offered admission. Students participated in nearly 4,300 campus visits to ensure their best fit. The class is engaging in 62 different areas of study and comes from 41 different countries and 700 hometowns. The students also have an array of diverse interests: 76% volunteered, 70% participated in sports, 55% were involved in the arts, 40% helped in part time jobs, and 20% were members of their school’s student government.